The hurrieder I go. . . So, one of the very many details which combined to create the Perfect Moment for Lee and Miller to purchase a long-desired city house was the willingness of our lender to accept a down-payment in two parts. We were required to put 10% down when we closed, and, when we sold the country house, we could put however much more seemed good to us as a second down-payment, which would not only immediately reduce the principle, but also our monthly mortgage payment, without incurring any additional points or fees. Essentially, it’s a free re-finance, which you may invoke Exactly Once. Avid readers of this blog will recall that we closed on the country house on Tuesday. The check representing our piece of the action cleared yesterday, and I contacted our mortgage lender to take advantage of the second down-payment. Long and short of it, we will be meeting to take care of this business at the Very First Opportunity — that being next Friday. At 8:30 am, making it the first item of business on the day. After my initial sigh of disappointment that Monday had apparently been off the board even before I called, I realized that this date? Is actually Perfect. Not only is it a full moon in these parts, but, it is also the third monthiversary of our moving into the city house. So, it’s actually all fallen into place neatly, and, as a bonus, we can still go see the Viking ship at Rockland on Monday. And! Since I do want to see the Viking ship at Rockland on Monday, I need to take this gift of three whole days with, ahem, “nothing to do” to write like the wind. I hope everybody has a terrific weekend, and I’ll see you on the flip-side. 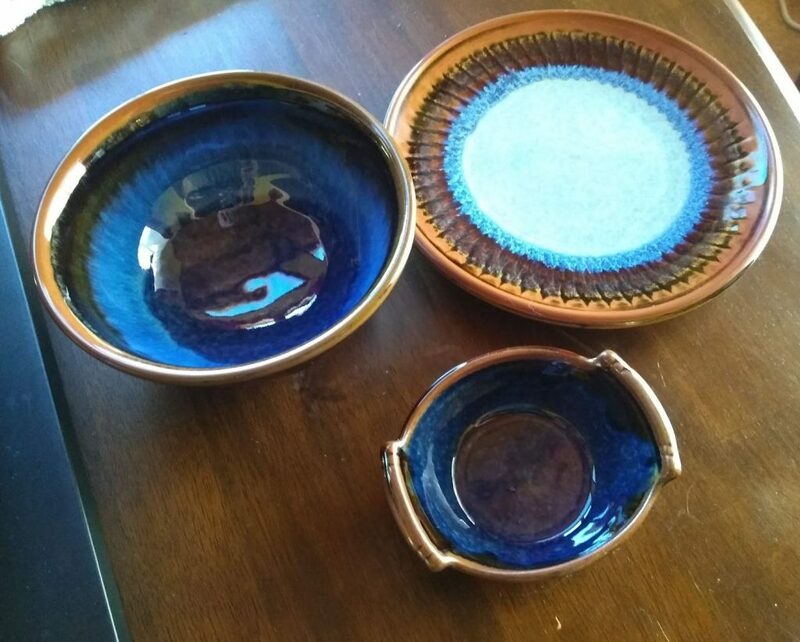 For those who are curious, here’s a pic of some of the pottery we bought at Georgetown Pottery. The pattern is called hamada and cobalt. Posted on July 20, 2018 July 20, 2018 Author SharonCategories Blog, City Living, Shifting House6 Comments on The hurrieder I go. . .
On June 8, 1992, Steve and I shifted such belongings as we had, and the cats (the then-crew being Hypatia (Patia), Nick derFluffer (Nicky), and Kodiak Felicia Brown (Kodi)) from our rental house in Waterville to a country estate in Winslow. As befit a country estate, we named it: Cat Farm and Confusion Factory. On February 16, 2018, we made an offer on a house in the city, which was accepted the next day, and the fun began. On April 27, 2018, we shifted the Cat Farm and Confusion Factory to the city house. . .
And, yesterday, July 17, 2018, after 26 years, one month, and 9 days, we transferred possession of the country estate to a young family, and we hope that the house will serve them as well as it served us. All of which is to say that, the Lee-and-Miller household is again a one-mortgage family, and my stars and garters, isn’t that a relief. In hindsight, the whole project was mad, from start to finish. But! We did it, and we’re pleased with all of the outcomes. The new house continues to provide adventures, challenges, puzzlements, and moments of delight. In the puzzlement category, we’ve very nearly unpacked all the kitchen/dining room/pantry boxes (we need to hold off on the bowls/glassware, because they will go into a cabinet which is slated for Power Tools and Moderate Reconstruction. The rest of the stuff, though, has been sorted, and! we have yet to turn up the good silicon spatulas (which I was very much missing this morning as I scrambled my eggs for breakfast), and also the Very Best Wooden Spoons, which, with the spatulas, used to live on the countertop next to the stove in the Old Kitchen, conveniently placed in a large ginger-jar-ish vase. The vase was unpacked weeks ago, but the rest are still missing in action. 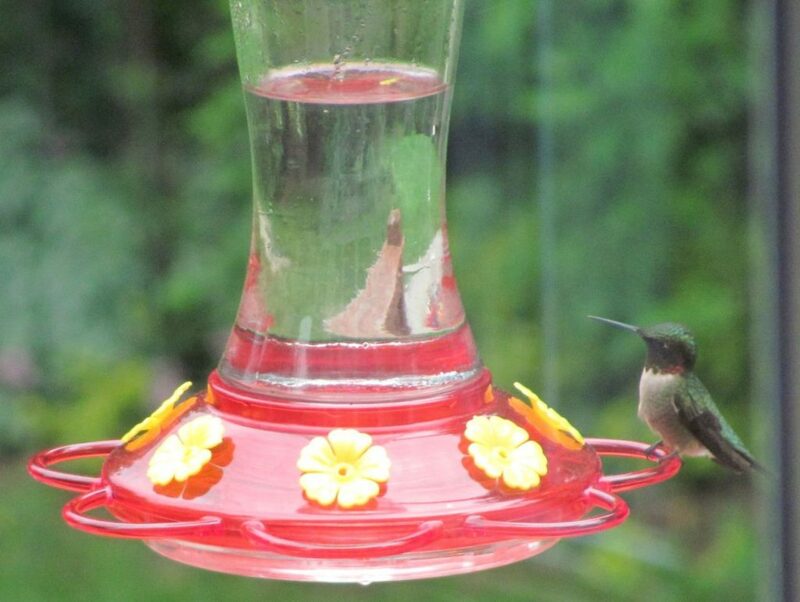 The hummingbird feeder has attracted several clients, who spend more time running each other outta the bar than they do actually drinking. I’m guessing that’s how they stay so svelte. In any case, they’re a source of enjoyment for the cats, and for me. Last night, while Steve and I were having supper, there came from the living room a grinding sort of noise. The cats were not pleased. I wasn’t pleased either, once it had been determined that the noise was coming from behind the wall. Possibly a squirrel has gotten in to the attic. Probably, I will call Someone tomorrow to remove him. I mean, yes, we do make Considerably Less Noise, and provide Much Less To-ing and Fro-ing, but that doesn’t mean the place is up for cohabitation. There’s a very nice yard out back for squirrels and such-like, and they may set up housekeeping there with my blessing. In writing news, I last night finished the first draft of the story commissioned for Infinite Stars Two, and have passed it on to Steve, for his sins, while I turn the fullness of my attention to Accepting the Lance. What else? Ah, I had made an appointment at the local spa and Friday had my first massage. It was good. By which I mean, wow! that hurt! and boy! that feels good! A couple of times I heard the knots let go, and — here’s the really weird part — I felt taller when I left. I’ve always thought to going to the spa and getting a massage as a self-indulgence I could neither afford nor required. May have to rethink that. I think that mostly catches us up. Me, I’ve got to refill the hummingbird feeder, balance the checkbook, and get to work. Everybody have an excellent day. So, today, among other things, I went to City Hall to register to vote. I ticked off Y, thinking, in my naivete that this would mean that the DMV would kindly place my name on the rolls of registered voters in Waterville. Come to find out, however, that this is merely a pleasantry, kind of like, “How are you?” (“Would you like to register to vote?” “Oh, you would? Well, isn’t that nice?”) and you still have to go to City Hall in person, show your driver’s license with your correct address to the Registrar and be added to the voting rolls. This is exactly what Steve did, yesterday, having stopped at City Hall to be certain that he was, in fact, registered to vote, and being told that, no, he wasn’t. He brought this information home to me, and since I had errands to run today, I added “register to vote, REALLY” to my list. We obediently went down the hall to the left, found two efficient looking women behind folding tables with computers and forms on them. One was already engaged with a customer, but the other had me come forward and asked what she could do for me. I blinked and pointed at the driver’s license. I opened my purse, and pulled out the receipt from Day’s Jewelers, which had my name and address on it. To her credit, she made it do, and I sit before you a registered voter in the City of Waterville. Possibly Steve looks more honest than I do. Possibly the Registrar made a judgement call. But, really, it ought to be as Easy As Possible to register to vote. Yes, identification ought to be required and dodgy papers ought to be questioned. But, honestly, a driver’s license ought to do the trick in a large percentage of cases. In other news, we’re home now, having taken care of picking my necklace, and registering to vote, and mailing the corrected page proofs to Baen, and stopping at the grocery for bread and wine. Time to go to work, I guess. Asyouknowbob, the SFWA Big Bundle of Space Opera vanishes into hyperspace in 9 days, 14 hours, and yada-yada minutes. This bundle includes books by Mike Shepherd, Stephanie Bedwell-Grimes, Terry Mixon, Vera Nazarian, Lee and Miller, and so! many! more! You want this bundle, you know you want it! Satisfy your craving now! Here’s your link. Also! There’s a kickstarter running for the publication of original anthology Release the Virgins! Lots of swell authors on board for this one, if it’s funded, among them Jody Nye, Keith R.A. deCandido, Lawrence Watt-Evans, Gail Z. Martin, Shariann Lewitt, Sharon Lee, Steve Miller — and more! Here’s your link. 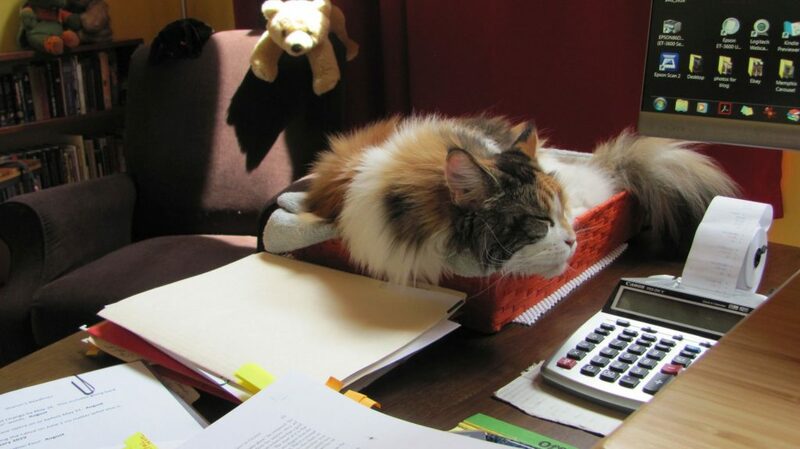 Here at the Cat Farm and Confusion Factory’s new location, proofreading of the 30th Anniversary Edition of Agent of Change continues to go forth. Given the sorts of errors that have been identified — dropped words and paragraphs — this one may warrant a third pass. Happily, we have until August to return it to Baen. Work also goes forth on a Liaden short story commissioned for a space opera anthology; which has an August delivery. And of course planning continues on Accepting the Lance. We have also been continuing with Necessary Adjustments to the house. 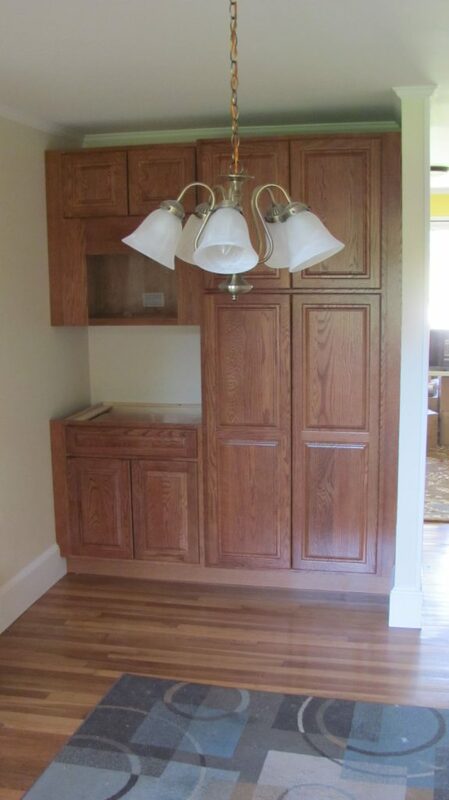 This week’s triumph was the installation of the pantry, which was completed yesterday. 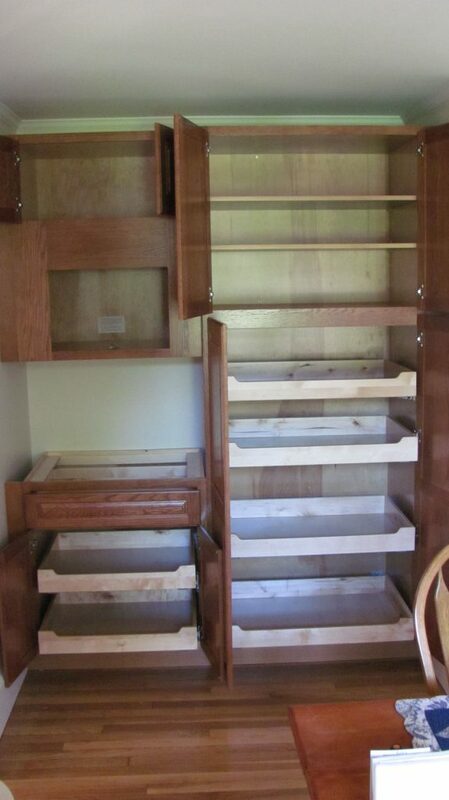 Today, April will stop by to measure for the countertop, and I need to ask her about the microwave shelf, which needs some adjustment, but, for all intents and purposes, we have pantry! And now I get these stupid boxes out of my living room. . . .which will then, of course, be replaced with whole other stupid boxes, as we get the Tech Room sorted out. Sooner or later, we’ll achieve a State of No Boxes and no contractors/installers, but I fear it will not be soon. And I do have to keep reminding myself that we haven’t even been living here for a full month. 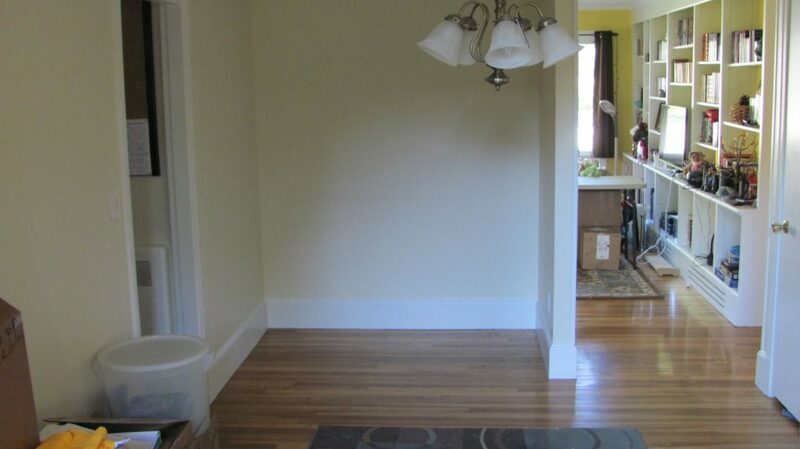 For those interested, here’s the Before and Afters of the dining room/pantry situation. . . .and now, to work. But! That’s not why I called you together today. Today, Steve and I let the WorldCon know that we will not be attending. We’ve had to cancel out of the last several worldcons, for various reasons, but what makes this particularly poignant, is — we have no science fiction conventions on our schedule at all, for the first time since. . .1997. Not sure how I feel about that. On the one hand, we are kind of busy here on the home front for the next while. On the other, con travel had become, if not a constant, then a unremarkable event in our lives. It’s going to feel odd to stay home. Maybe we can produce another vacation; the last one was a lot of fun. And, Steve has decided to join me at the National Carousel Association Convention in September, which may scratch the con-going itch, a little. Which leads me to the topic of Changes. Steve and I have been through some Changes, starting with his becoming a Bionic Being in January 2011. Not all of the Changes have been profound, and sometimes we went months at a time with hardly any Change at all, absent The Usual. Around the middle of 2015, things started to heat up, with Steve’s stepfather, whose health had been fragile for several years, beginning to fail more seriouisly, requiring several family meetings, and trips to Maryland, to try to plan for the best good of Pete and Steve’s mother. Pete died in the fall of 2016; soon after that, Steve was hospitalized for a cardiac event, and was forbidden to drive for six months. Right after he got his wheels back — his mom began to fail dramatically. More trips back and forth to Maryland for him, while I held the home front. During one such separation, I fell ill with. . .Something. . .which changed my metabolism in odd ways, and before I was fully recovered, it was necessary to make one last trip to Maryland, to tell Mom good-bye, and see her placed properly next to Pete. Just when we were beginning to accommodate that Change, we up and bought a house, which is Changing our lives in all kinds of amusing, frustrating, and unexpected ways. I hadn’t realized that we’d had such a. . .busy last couple years until I was putting the files back into the file cabinets, which gave me an Annual Overview. Apparently we are entering that Time of Life where Change will be the rule, but I hope Our Personal Changes will slow down just a bit, and give us so time to find our feet. . . .and that’s what I’ve got today. Hope you — yes, you — are enjoying the day. So, the next Liaden novel — Fifth of Five/Accepting the Lance. After after close consultation with the characters, and of course the cats, Steve and I have spoken with Madame the Agent and Madame the Publisher, and — we have agreed upon a January 2019 delivery date*. Madame the Publisher allows us to know that the thirtieth anniversary edition of Agent of Change will be on sale on October 30, 2018. We will be speaking with Mr. Blyly to find if he thinks the Uncle will find it possible to take pre-orders for signed copies of that edition. Madame also lets us know that A Liaden Universe® Constellation: Volume Four has been penciled into the schedule for Summer 2019. In not unrelated news, we have consulted with our bank account and our qe’andra and — we will not be attending WorldCon this year. We will instead be badgering the contractors of Central Maine to paint and do small repairs at the Old Digs so that it can be shown and (we hope speedily) sold. Steve and I apologize for being the authors of these inconveniences, but — necessity is. 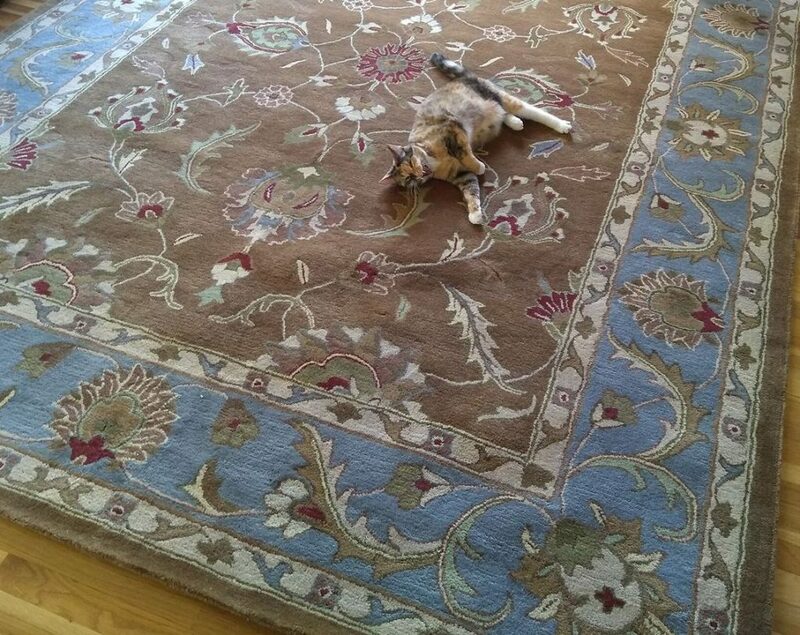 In new house news, we have today put the rug down in the living room, signifying — something. Probably, boredom with having to dodge around it’s rolled up bulk every time we wanted to open the side windows. *This is a delivery date, not a publication date. “Delivery date” is when we turn the finished manuscript into Madame the Publisher. Today! — Well. Last night, SFWA released its Gigormous Space Opera bundle through StoryBundle. There’s a bunch of good reading here, and, boy! what a bargain! In other news, we here at the Cat Farm and Confusion Factory still away the arrival of the pantry, which is rumored to be on course for delivery next Thursday. Or maybe Friday. Anyway, it should be installed by the end of the month and we will be fully accoutred. 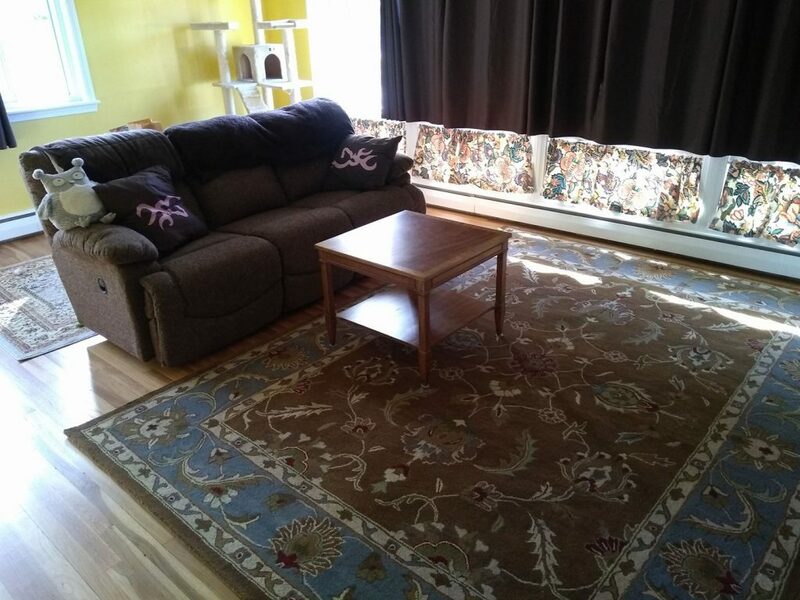 We still are not entirely moved out of the Old Digs, which needs to happen soon, so we can get it cleaned, and painted, and the rug in what used to be my office replaced, and on the market, as paying two mortgages is, well. Tiresome. Tomorrow sees the grand return of the War Engineer, who will reinstall the now-repaired screens and frames, and also help me install a bulletin board where we can post upcoming deadlines and other business and personal news of note, and I can feel organized again. I also anticipate the arrival of an installer of UV film tomorrow, who will give us a quote on installing, err, UV film in the clerestory windows in my office, and also in the large windows in the living room. For those following the saga — the pool is gone, leaving a circle of packed sand and a stray volleyball behind. The team that removed the pool also kindly took away all the paraphernalia of the pool (with the possible omission of the beach ball; I seem to have lost track of the beach ball), so we don’t have a shed full of toxic chemicals down back, only a shed full, as I am given to understand, wasps. All the cats continue to roam the house and intermingle; there has been no bloodshed, nor scarcely a harsh word uttered. And, now, having taken these brief moments to update y’all on our doin’s, I’m going to return to the Comfy Chair and the page proofs for The Gathering Edge. This morning, I’m still feeling like somebody hit me in the head with a 2×4. I will therefore today pilot my desk, catching up the banking and accounting, proofing The Gathering Edge, and pursuing the laundry. As hard as it was getting (almost) everything shifted from the old house to the new, I’m very aware that that was the Easy Part. Wouldn’t do to run out of energy now. 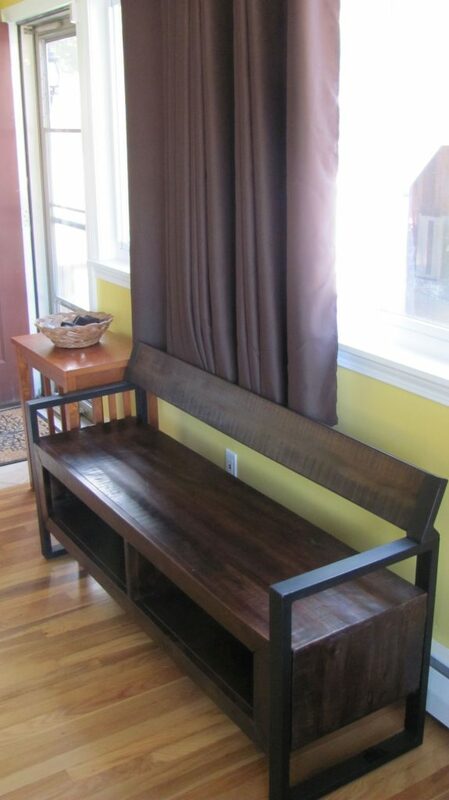 In other news, and on the subject that what is old is new again. . .one of the things that I brought to the household when Steve and I decided to combine our resources was a Lane cedar chest. 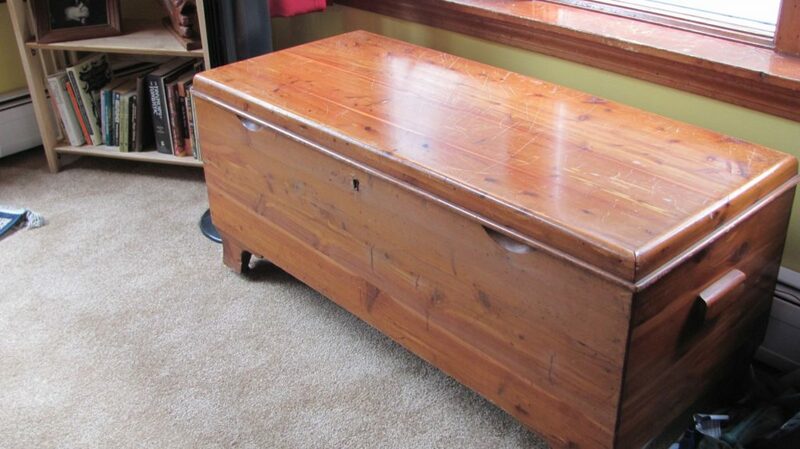 I can’t imagine that I actually bought my own cedar chest when I was in high school (there was a Big Promotional Push aimed at high school girls from the furniture store in town — all the girls of course had to start their Hope Chest in eleventh grade), so I’m going out on a limb and saying that I had the chest from my grandmother. It is, in any case, rather old, and scratched, from long and close association with cats. For the last many years, the chest lived in our bedroom, holding blankets and comforters and the occasional wool sweater. However, the new bedroom is smaller than the old, and there’s no room for the cedar chest, which then fell back into my honor. 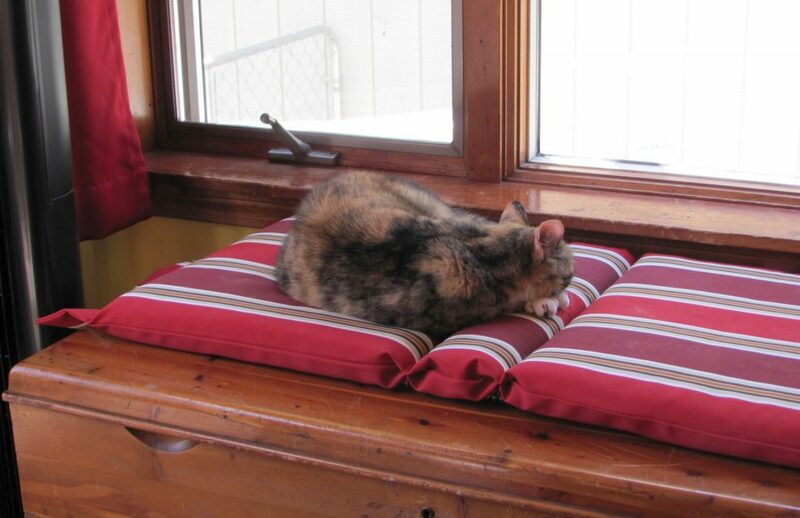 I put it under the side windows in my office, to the Vast Delight of Belle, promised to buy it a cushion, and that was the last I thought about it — until yesterday. You see, for all of its many charms, my new office has no closet. And while a lot of what used to be in my old office’s closet have been usefully redistributed to other parts of the house (notably, the closet in the Tech Room), I still have some things with me that could benefit from being put in a closet. I was dithering over these things yesterday, and sat down on the cedar chest to mull over the situation, when it hit me. I slowly stood up and stared down at the cedar chest, realizing that what this was? This was A Big, Empty Box. In fact, it is a place to put things that could benefit by being somewhere which is neither the floor nor the bookshelves.